There is probably a machine that does what I did today, and does it faster, and maybe even does it better. But I don’t know where I would find that machine, and even if I did, I probably wouldn’t be able to afford it, not even to rent it. So it doesn’t make any difference, except if I had done it with a machine, no one would think I was crazy. Crazy enough to do what? The daffodils not only lined the roadside, but they continued down most of the walk as well. I decided in 2016 that those daffodils lining the walk were a mistake. The foliage took so long to ripen–into August, some years–that it looked a mess for most of the summer and smothered or at least stunted the perennials I had planted there. So in July of this year I dug them up. 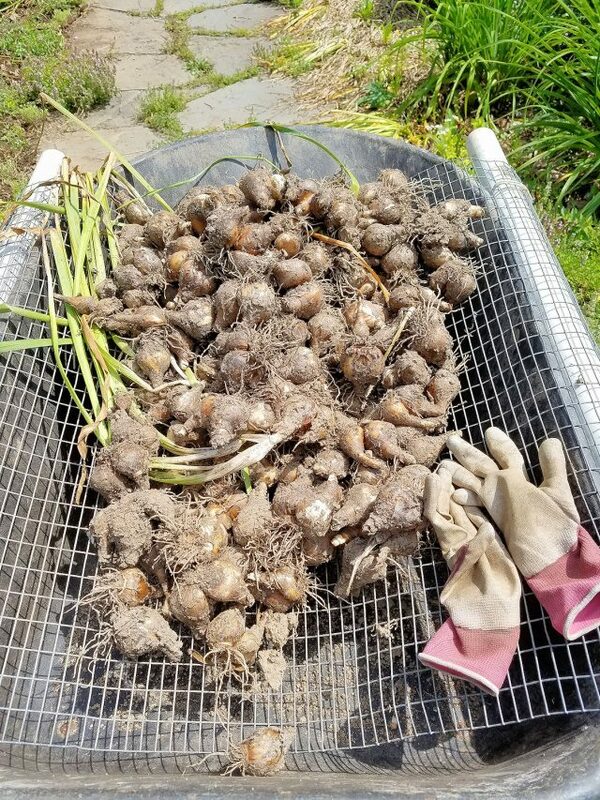 These were dug July 21 and many of the bulbs still hadn’t fully ripened their foliage. 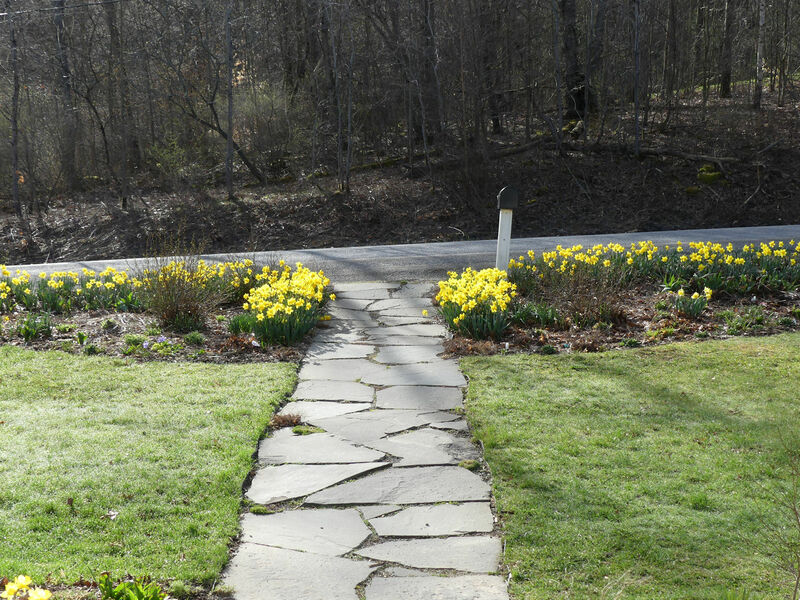 If you look beyond the wheelbarrow in the upper right, you can see more of the daffodil foliage along the walk covering just about all available space. That’s why they needed to be moved. It was tricky to dig them up and not uproot the plants growing around them. Eventually I realized it was faster to dig everything up and then replant the perennials. The soil was quite moist and they weren’t out of the ground very long at all. When all the bulbs were dug, I bagged them in large onion bags I had saved for the purpose. I tried to bag the largest ones first, so that they were roughly sorted by size. As I bagged them, I removed the remaining foliage and counted them, 40 to a bag. 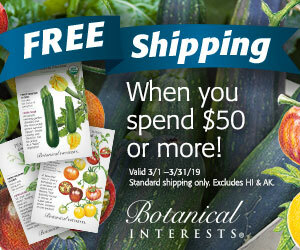 Fifty would have been a nice round number but 50 of the biggest bulbs didn’t fit in a bag. When I was all done, I had eight bags of daffodils! About double what I was expecting. Where am I going to put all these daffodils? I knew I wouldn’t replant them until fall, so I had some time to think about it. I eventually decided it would look spectacular if these daffodils lined both sides of the road. The opposite side of the road slopes upward from my garden. It’s a rural road, and a ditch runs along side it, and since the ground slopes upward, the ditch has a bank sloping upward to the woods. Just imagine all those daffodils along the walk lining the opposite side of the road instead. That’s the Vision I’m after. You’re going to plant daffodils there? You’re crazy! I used yellow plastic tent stakes similar to those at left to help me eyeball my planting line. No tossing bulbs randomly and planting them where they fall for me! I’d never find half of them in that weedy wilderness, and I would run the risk of the sun setting before they were all planted. By setting three tent stakes–one at each endpoint plus the center–I could roughly gauge where the next bulb should go. I knew I wouldn’t get them in a perfectly straight line, and I knew I would have to deviate from the line to avoid rocks. That would be sufficient to give them a quasi-random-looking arrangement. 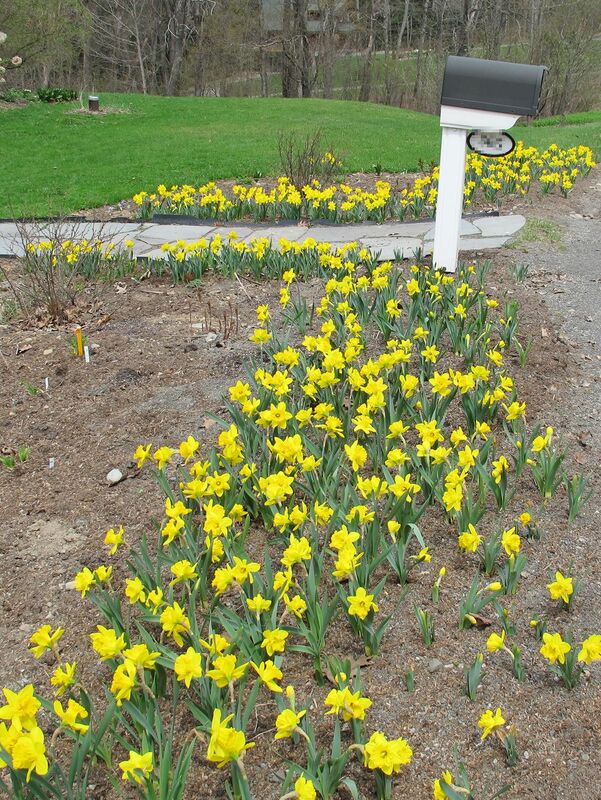 And really, everyone knows daffodils don’t grow wild in upstate New York, so no one expects them to look like they just grew there. This Root Slayer Shovel by Garden Radius, pictured at right, was my secret weapon. I love my Pro-Plugger for planting in established beds and in lawn, but for completely uncultivated ground, nothing I’ve ever tried can do as well as the Root Slayer–and I’ve tried plenty. I would still be plugging away with the Pro-Plugger or with my previous go-to, the Dibble Bar, instead of being finished and writing this blog post thanks to the Root Slayer. I looked for the bag with the largest bulbs and emptied bag #1 into a tub trug and crossed the street. I started in the center and worked to one end, then I went back to the center and worked to the other end. I thrust the Root Slayer into the ground, pushed it forward, pulled it back, and, grabbing a bulb from the tub, pushed a bulb into the slot as I pulled the shovel out. After a while I realized it was easier on my knees if I made six holes and then knelt to place six bulbs. My hand could easily pry the slit open enough for me to be able to push the bulb in. That’s what I did, over and over until it was done. I had a Vision of how it would look next spring, and the Vision kept me going. 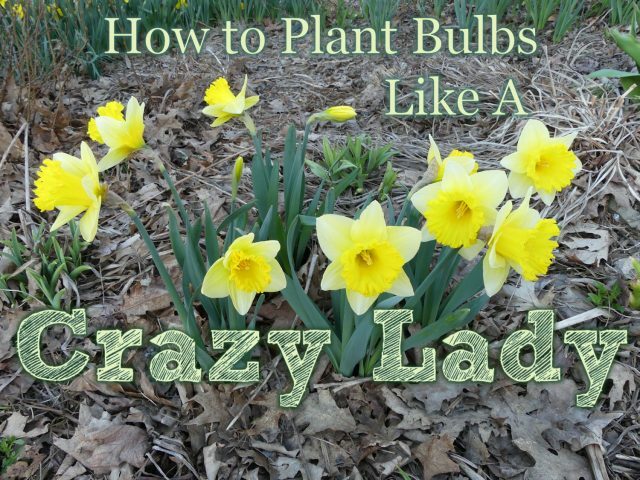 When a car went by, I imagined the driver thinking, “Look at that crazy lady planting bulbs along the road. How long can she keep it up?” I wondered the same thing, but then I would look for the end stake, and it was closer than I thought, or I would look in the tub, and there were less bulbs in it than I expected. When a bag was done, I would take a break, carefully marking my spot so I could pick up where I left off. With long, repetitive projects like this, I think it’s important to take breaks to rehydrate and to give your muscles and joints a chance to rebound. Perhaps I could have gotten them all planted the first day if I hadn’t taken breaks, but I think I would feel a lot more creaky than I do if I hadn’t given my joints a rest. I started my first horizontal line close to the road. After I finished planting a line, I would move each of the tent stakes up about a foot, and start the process all over again. 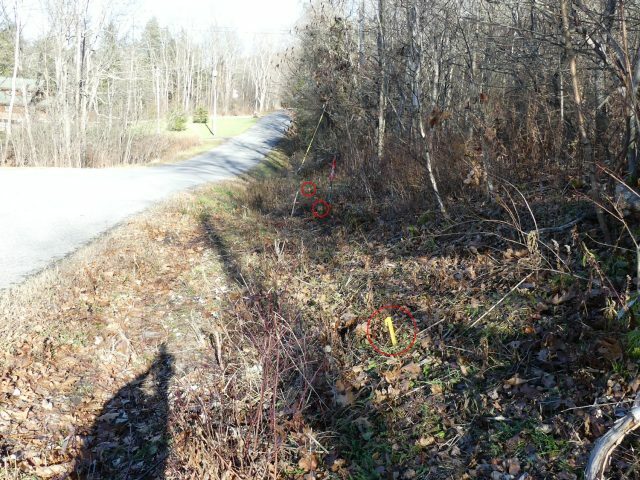 The three yellow tent stakes are circled in red. The center stake was directly across from the front walk. The end stakes were directly across from the ends of the flower beds on “our” side of the road. However, when I started on the last bag before dark, I changed my procedure a bit. First, I got two more tent stakes from the garden shed. After I planted six bulbs from the center, I marked my spot with a tent stake. Then I went back to the center and planted six on the other side. Then I did the second six on the first side, and then a second six bulbs on the second side. That way, if I had to stop before I finished that line, it would be evenly centered on the midpoint. I wasn’t certain I would have a second good day to finish, so I wanted it to be planted evenly along the midline. 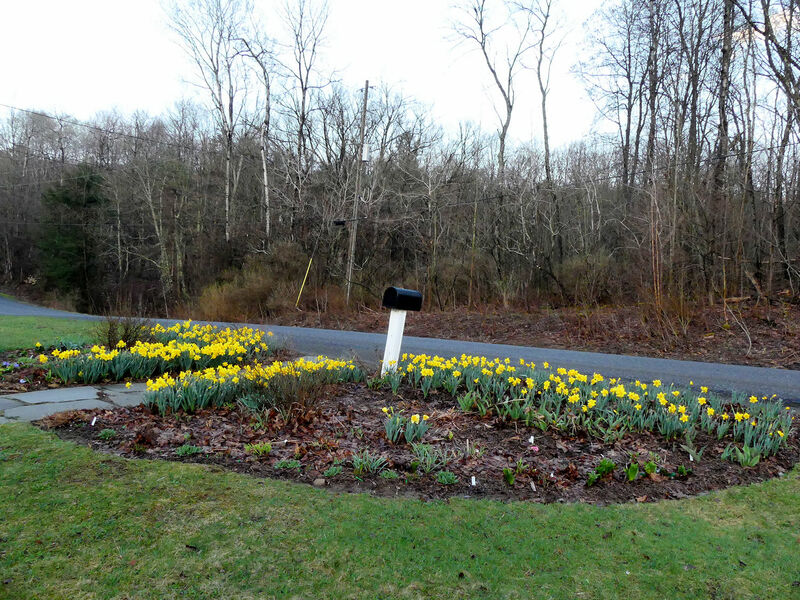 But I did have a second mild day, and for the very topmost line–when I wasn’t sure the bag of bulbs would last to the very end–I planted them in small batches out from the center again. When the last bag was empty, I felt a mixture of elation (yahoo! I did it!) and anticipation. 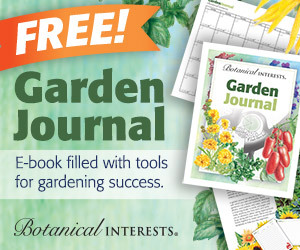 I can’t wait to see the Vision unfold next spring! It should look spectacular, Kathy. Can’t wait to see the photos in the spring. Oh girl, you wear me out just reading about your project. Knowing how beautiful it will look next spring is sure what got you through this. Well done. I can’t wait to see it too.